When it comes to nozzles, “standard” doesn’t mean off-the-shelf. 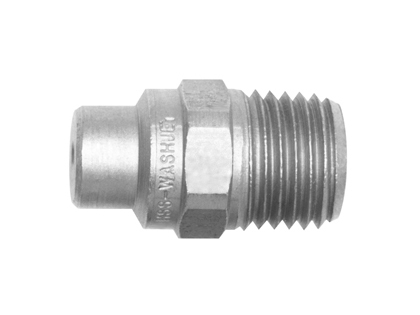 While NLB standard nozzles are designed for general use (instead of specialized uses like pipe cleaning or abrasive cutting), each is custom-sized to suit your application. When ordering, be sure to consider not only the pressure and flow rate of your pump unit, but the actual pressure at the nozzle, which is always lower. Our standard nozzles have a single orifice that can provide either a tightly focused 0° stream or a wider fan spray, depending on your requirements. The five shown below are designed for a maximum pressure of 20,000 psi (1,400 bar), and simply screw on the end of any NLB lance (and other tools) rated for that pressure.